Perfect for entertaining or as a gift! Impress and delight with our Seafood Tower, complete with a variety of delicacies from the sea. We will deliver everything you need to defrost, assemble and serve within minutes, all you have to do is add some ice and some very hungry seafood lovers. A dramatic (but simple!) appetizer or main course that won't soon be forgotten. The prep for our fabulous seafood tower is simple. Delivered pre-cooked, our fresh, frozen seafood needs simply to be thawed for 24-36 hours in the refrigerator. It’s recommended that after thawing you rinse the Snow Crab Claws and soak King Crab Legs in cold water for at least 15 minutes, changing water once, to remove the salt-water glaze. Step 1: Place the cocktail sauce in the center. Step 2: Fill each tray with lots of ice. Step 3: Arrange the snow crab claws and jumbo shrimp around the cocktail sauce. 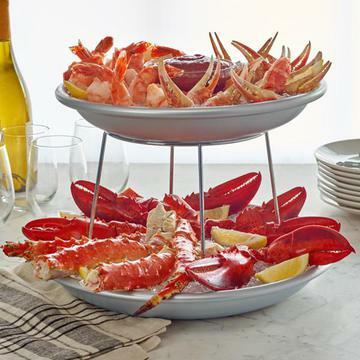 Step 4: Cut king crab legs in half and arrange on the bottom tray. Step 5: Add Maine lobster claws and sliced lemons. (134g serving (or 1 leg), calories 130, calories from fat 18.5, total fat 2.06g, saturated fat 0g, trans fat 0g, cholesterol 71mg, sodium 1436mg, total carbohydrate 0g, dietary fiber 0g, sugars 0g, protein 25.93g, vitamin a >1%, vitamin c 1.7%, calcium 7.9%, iron 5.6%. Wild caught, product of Russia. This is a whole, natural food item with no additional ingredients included. (3 oz. (85g)) calories 84, calories from fat 8, total fat 1g, saturated fat 0g, trans fat 0g, cholesterol 166mg, sodium 190mg, total carbohydrate 0g, dietary fiber 0g, sugars 0g, protein 18g, vitamin a 4%, vitamin c 3%, calcium 3%, iron 15%. Farm raised, product of Southeast Asia. Ingredients: Farm raised shrimp, salt and sodium tripolyphosphate to retain freshness. (3 oz. (85g)) calories 60, calories from fat 5, total fat <1g, saturated fat <1g, trans fat 0g, cholesterol 61mg, sodium 130mg, total carbohydrate 0g, dietary fiber 0g, sugars 0g, protein 14g, vitamin a 2%, vitamin c 2%, calcium 4%, iron 12%. Wild caught, product of Canada. (145g (1 cup) calories 142, calories from fat 8, total fat 1g, saturated fat 0g, trans fat 0g, cholesterol 104mg, sodium 551mg, total carbohydrate 2g, dietary fiber 0g, sugars 0g, protein 30g, vitamin a 3%, vitamin c 0%, calcium 9%, iron 3%. Wild caught, product of USA & Canada. (1/4 cup (72g)) calories 90, calories from fat 0, total fat 0g, saturated fat 0g, trans fat 0g, cholesterol 0mg, sodium 550mg, total carbohydrate 20g, dietary fiber 1g, sugars 10g, protein 1g, vitamin a 2%, vitamin c 0%, calcium 0%, iron 0%. Ingredients: Ingredients: Tomato paste, horseradish (horseradish, vinegar,salt, soybean oil), sugar, water, salt, vinegar, sodium hexameaphosphate, onion, garlic powder, natural flavor, soybean oil, guar gum, xanthan gum, klerzyme, mustard oil. (1 full tub or 2 oz. (100g)): calories 876, calories from fat 874, total fat 99g, saturated fat 62g, trans fat 0g, cholesterol 256mg, sodium 0mg, total carbohydrate 0g, dietary fiber 0g, sugars 0g, protein 0g, vitamin a 61%, vitamin c 0%, calcium 2%, iron 0%.